The Age of American Unreason, Susan Jacoby, Pantheon. Ignorance is bliss. Or is it? In “The Age of American Unreason” Susan Jacoby—author of “Freethinkers” (2004)—explores the anti-intellectualism (too much learning can be a dangerous thing) and anti-rationalism (there are no facts, just opinions) that increasingly characterize American culture and political discourse. Among other things, Jacoby explores the erosion of Americans’ knowledge about geography, science and history; the public’s short attention span (fostered by TV, video and other digital media); and the failure of the country’s public education system. Other People’s Rejection Letters—Relationship Enders, Career Killers, and 150 Other Letters You’ll Be Glad You Didn’t Receive. The Executioner Always Chops Twice—Ghastly Blunders on the Scaffold, Geoffrey Abbott, St. Martin's Press. 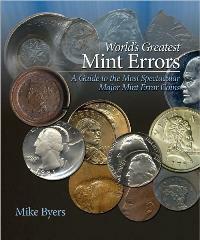 World’s Greatest Mint Errors—A Guide to the Most Spectacular Major Mint Error Coins, Mike Byers, Zyrus Press. The Dust Bowl—An Illustrated History, Dayton Duncan and Ken Burns, Chronicle Books.